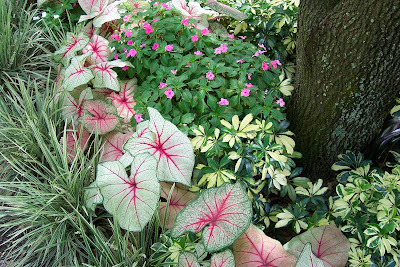 have i mentioned lately how much i enjoy the wonderful summer foliage of caladiums? truly... what other plant in florida can give so much bang for the buck in a garden? this is the time of year when all the annuals i planted in february and march have to be cut back due to thier scraggly, leggy appearance, not to mention they are withering from the sun-scorching days. when planted from bulbs, these multi-colored, maintenance free, summer bloomers will last through at least the month of august and sometimes through september. 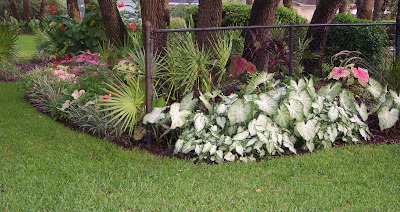 if not for caladiums my yard would be begging for color in july and august. every year i purchase the usual suspects... my all-time favs of white queen and miss muffets. in addition i usually try something new. 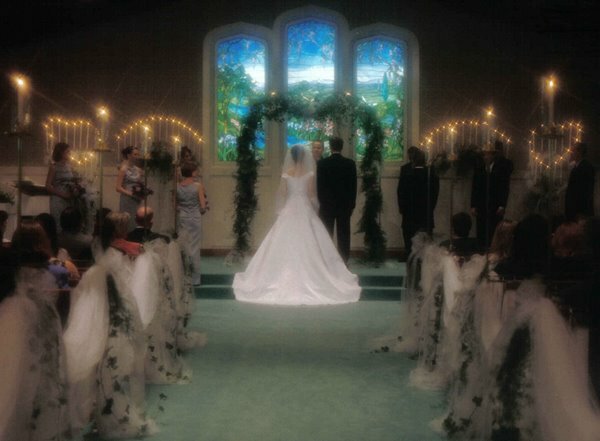 this year it was carolyn whartons and june bride. i am newly in love with the carolyn whartons and will likely re-purchase next year. the june bride has added some height to the all-white bed with jackie suthers but they have turned out to be a little too tall for my liking. i'm not complaining at all though about the splendid display they are giving me on one of my side-yard beds. 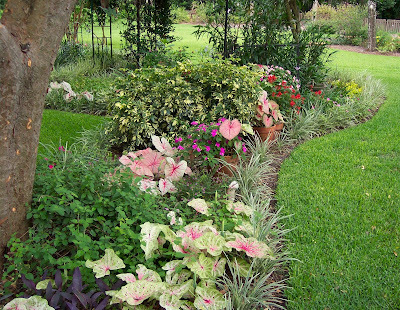 do you have a favorite caladium or plant you particularly love for the summer in florida... or anywhere for that matter? You've given me a new perspective on caladiums. My all-time favourite flower is the gardenia. For the height of summer, I love the bat-faced cupheas. They thrive in the heat and humidity. 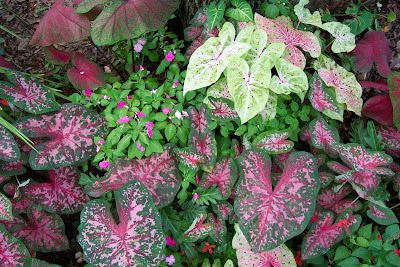 my favorite caladiums are the ones at your house! is that photo under the word "july" in the visitors section new? it's beautiful!!!!! I like Miss Muffet too. One of my favorite summer plants in the penta. She takes the heat and humidity in stride, and always presents a fresh face all summer long. mlm- I think there are a couple of new photos...either that or I have had my head in the sand! Wow...I'm really lost with all this plant talk but the pictures are beautiful! sophiemae: i am also a fan of gardenia- the oh-so-lovely fragrance and the color of white make them a standout. mlm: you are my funny girl. yes, i just switched that photo out- thanks for noticing. susan: pentas are an easy one too. i have many of them in all colors- i find that if i dead head them and keep the under limbs trimmed they are happy to perform all year. jane: you are oh so right about the photos --not the sand. princess: i'm glad you visit anyway... and you are welcome anytime to look at the pictures.